Angular limb deformities (ALD) occur in foals and if left untreated may result in lameness and poor performance as adults. 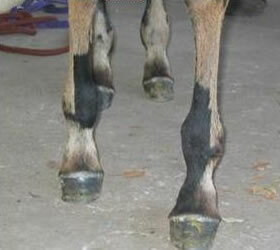 These deformities can be present at birth or develop as the foal ages. The most common sites for ALD’s are at the level of the growth plate such as the distal radius (carpus/knee) and distal cannon bone (fetlock). The deformities or deviations are described as either valgus or varus and we most commonly see carpal valgus (knock-knees) and fetlock varus (toe-in). The treatment of ALD’s depends on the growth potential that is left at the affected growth plate. 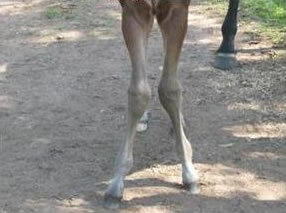 As foals age, the growth plate closes, with the lower limb’s growth plate closing earlier than the upper limb. For this reason, surgical treatment of ALD’s is often recommended when the foal is as young as 4 weeks of age. Surgical treatment is undertaken when the deformity is worsening or where it is not responding to conservative treatment. Often, stall or small yard confinement alone is sufficient to correct mild deformities. 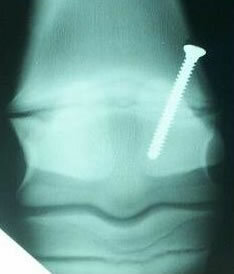 Confinement is usually carried out in combination with corrective trimming of the affected foot by your farrier. Your farrier and veterinarian will often evaluate your foal together to determine if the foal is improving with conservative therapy alone. Sometimes, your veterinarian will recommend surgical intervention in order to obtain the straightest limbs possible to prevent future complications such as lameness. The optimum time to perform surgery is during maximal growth at the level of the growth plate. Remember, once the growth plate closes, surgery is unrewarding and will not benefit the horse. Periosteal stripping is a surgical technique that is performed frequently by surgeons around the world to correct ALD’s in foals. This technique involves making a keyhole incision through the skin and then incising the periosteum (sheath around every bone) to ‘release’ the tighter side (concave side) of the limb immediately above the affected growth plate. This is often performed on fetlock deformities at the age of 4 weeks and on carpal deformities (knees) at around 6 weeks of age because of the maximal growth potential at these times. This procedure is frequently sufficient to correct most mild deformities and results are generally rewarding. Occasionally, for more severe deformities or where periosteal stripping may not have achieved sufficient limb straightening, we may recommend that the foal undergo transphyseal bridging. This procedure is performed on the convex side of the affected growth plate where growth is faster than the other side of the limb. We insert a screw across the growth plate to stop growth on the convex side to let the slower side ‘catch up’. This is a more invasive technique and a second surgery is needed to remove the screw when the limb is straight to prevent over-correction. Transphyseal bridging is usually recommended for fetlocks when the foal is 3 months old. For knees, we tend to get a reasonable response even up to 12 months of age, however, if the deformity is severe, we will often recommend surgical intervention in the first few months of life. This surgical technique is highly effective for achieving limb straightening and is a routine procedure for many affected foals in breeding areas all over the world. Yearlings at the sales are critiqued by many veterinarians and potential buyers. ‘Bent legs’ are a common reason for yearlings not achieving their optimum selling price because of the chance for future complications. In foals with ALD’s, early evaluation and intervention by your veterinarian and farrier will optimize your potential for presenting a horse with straight limbs and achieving the best selling price.